In modern Japanese, the hiragana letter has exactly the same pronunciation as the hiragana letter , that is, 'zu' or 'dzu'. When the kana scripts were reformed after the Second World War, was almost completely replaced by -- but not quite. There are still a few words that preserve as it originally was. Mostly has been retained where a word is etymologically derived by voicing a . There are also cases where the is felt to be the result of reduplicating a (see examples below). If you use a word processor in Japanese, you'll find that typing Z-U in some cases won't get you the word you are looking for. For instance, in order to get the verb tsuzuku, you must type T-U-D-U-K-U (or T-S-U-D-U-K-U) to get the kana string , which will then convert to . Typing T-U-Z-U-K-U will yield , which will NOT convert to . 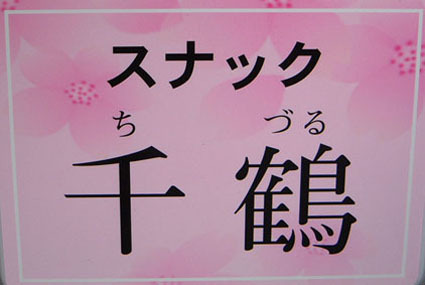 The following are four examples of from notices, signs, and labels in Japan. This is the sign for a 'sunakku' (snack) or small bar, named Chizuru ('thousand cranes'). The reason for the here is quite simple: the word chizuru is derived from chi (thousand) + tsuru (crane). In combination, the tsu in crane is voiced to become zu - thus, chizuru. This is from a packet of cha-zuke nori. The word cha-zuke is formed from cha 'tea' and ( ) tsukeru 'to steep, to soak, to pickle, to salt'. The use of in the above label is thus a natural result of the derivation of the word. (Note on cha-zuke: A bowl of rice, normally eaten as an accompaniment to a meal, can be converted into a simple meal by pouring hot water and some condiments over the rice. Originally this involved pouring hot tea over the rice, hence the name cha-zuke, 'steeped in tea', but nowadays it's more common to use hot water or broth, topped off with seaweed, tiny rice crackers, salt, etc. The packet shown above contains the topping, mainly nori seaweed; you supply the hot water! The o is honorific in form; it originally derives from the feminine habit of attaching an o to just about any kind of food, but has partly entered masculine language in words like o-cha 'tea'. However, most men would draw the line at o-biiru 'beer', which is a clearly feminine usage! Notice the characters for nori, which are one of the many 'exceptional usages' that must be learnt in order to read Japanese). This is one of a small number of cases where the sound is felt to be 'reduplicated' -- that is, tuzukeru is felt to have two tsu's in succession. This is the sign on an emergency bell in a train. The meaning is: 'Emergency bell. Press continuously in an emergency'. As in the above case, zutsu is felt to be a repeated . Historically is indeed the reduplication of the ending in the native counting system, i.e., hitotsu, futatsu, etc. (1, 2,...). The word is supposed to have been modernised to -- that is the form given in dictionaries -- but as this example shows the historical form still lives on, even though not strictly correct. This sign was found in a bank, on a box of tissues used for wiping customers' seals after use (seals or chops are used instead of signatures in Japanese banks). The meaning is 'please take one at a time from this aperture'.